In this private lesson, you will learn more about the legendary samurai warriors. 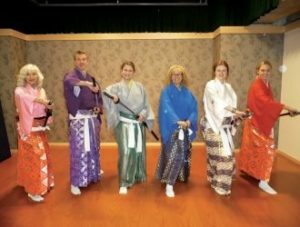 You will wear a samurai costume, learn about the lifestyle and etiquette of samurai classes and finally take the sword and learn the basics of kenbu, a highly stylized sword dance that samurai used to perform as training and to find concentration. This is a unique experience to learn in-depth about this cultural heritage of Japan. The instructors are skilled Kenbu masters and are also fluent in English, and they will be happy to answer your questions. Photo time and a souvenir of your time in the kenbu dojo (training hall) are included in the tour.